General Characteristics: Medium in height, erect, maturing within about 12 months, producing from 2 to 5 oha; identified by the dark reddish-brown to purplish-brown coloration on the lower half of the petioles with reddish-flecked area at base. Petiole: 60 to 80 cm. long, dark reddish-brown or purplish-brown on lower half, sometimes lightly tinged with green, pinkish to whitish at edge, a reddish-purple ring at base with lighter reddish-purple, flecked area for 3 to 5 cm. above. Leaf blade: 40 to 50 cm. long, 25 to 35 cm. wide, 30 to 40 cm. from tip to base of sinus, narrowly ovate; piko whitish to pinkish; lobes obtuse with shallow, wide sinus. Corm: Flesh white with light pinkish tinge, especially near the apex, the fibers yellowish; skin reddish. Origin, and derivation of name: Native variety; hapuu means "abounding" or "plenteous." Distribution: Grown to a limited extent, under both upland and wetland cultures; this is an important poi taro in a few scattered localities, the vicinity near Hana, Maui having the most extensive plantings. 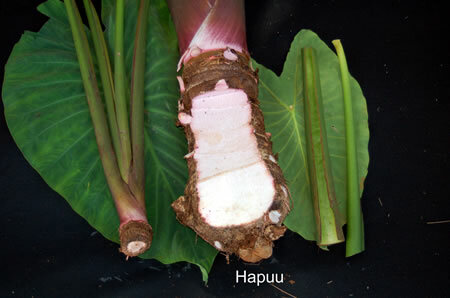 Use: Makes a light-colored poi of good quality; the leaves are considered very good for luau.